*Menthol "Vapor Rub" Stick use eucalyptus & camphor or peppermint, tea tree oil, etc. *Lotion bars (use lotion/skin safe fragrance oils only). *Solid perfume sticks are great for purse size & travel! *Massage bar use massage bar soap mold and relaxing FO's! *Suntan butter bar - use a tropical scent like Pina Colada or Tranquil Tropics! *Pampered Paws Doggy & Kitty Paw Balm for rough or cracked animal paws! *Market it as either a Shea Butter, Cocoa Butter, Soy lotion, vitamin E bar, etc. Blue Sugar Type (revision) *NEW for 2019! Believe me you get ALOT from 1 gallon! I just finished the one I had. This base is the "balm"! LOL! Honestly, my testers adore this formula. It holds up well to the pocket test, has a nice glide to it and lasts fairly well. Shea butter adds label appeal and it never goes "grainy" on me like my homemade formulas do. The gallon bucket makes... gosh maybe 400 .15 oz. tubes of balm? I lost count, but a lot anyway. 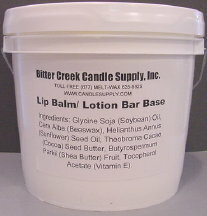 I used to think making lip balms was easy when I had my own formula but this base is better than my homemade! I have tried lip balm bases from at least 5 different suppliers and this one is hands down the best! It's Smooth, works like a dream and doesn't have a strong odor. Wish the gallon wasn't out of stock as I was going to order it today.